It really has been comic book superhero mania recently, with last week's UK release of Avengers Assemble (released in the US today), the final trailer for The Dark Knight Rises going online on Tuesday, and now a new trailer for The Amazing Spider-Man hitting the web too (pun intended!). Filling the spidey-boots and suit this time around is actor Andrew Garfield of The Social Network fame, who has the heavy task of getting to grips with his newly found powers and alter-ego, whilst of course avoiding the police, maintaining a relationship with girlfriend Gwen Stacey (Emma Stone), discovering the secrets and truths about his parents, and saving the world from the villainous Lizard (Rhys Ifans) - the big question is, when will he fit in time for his homework!? 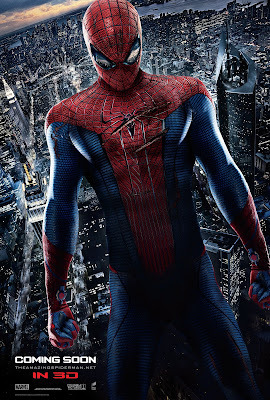 The Amazing Spider-Man is released in cinemas across the UK on July 4th 2012. Are you excited for this franchise re-boot? Do you think it will be a blockbuster or lacklustre? Leave your comments below! I can say I'm thoroughly looking forward to this, seeing as we never knew about his parents, it's nice to see a Peter Parker who wants to know more about them rather than perv on his next door neighbour for 3 films. I do hope that Sony and Marvel come to some agreement as to include Spidey in a future Avengers film. Couldn't agree more, I really do think that this film will do so much good for the franchise - and yes Spidey in the Avengers 2 would be pretty awesome too!